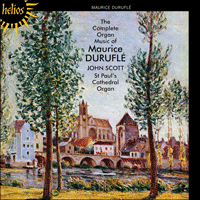 Erstwhile organist of St Paul’s Cathedral, John Scott, puts the cathedral’s wonderful instrument to the best possible use in this album of Maurice Duruflé’s complete works for organ. Duruflé studied with the greatest organists of the age, Charles Tournemire and Louis Vierne, and there is no doubt that his exposure to the genius of both in their respective organ lofts had a formative influence. Duruflé’s compositional reputation is assured through one work: his beloved Requiem of 1947. In his organ music we hear his fascination with Gregorian plainchant themes which is such a feature of that work. Maurice Duruflé (1902–1986) was born in Louviers. Between 1910 and 1918 he attended Rouen Cathedral Choir School. Rouen produced Marcel Dupré (1886–1971) and is also the home of the magnificent Cavaillé-Coll organ at St Ouen installed by the builder between 1888 and 1890. Duruflé could hardly have failed to have been influenced by that instrument and those who played it; his attraction to the organ and his love of Gregorian chant were established when the composer was a chorister. In 1919 he moved to Paris in order to study the organ with Charles Tournemire, whose deputy he later became at Ste Clothilde, and Louis Vierne, who was then organist at the Cathedral of Notre-Dame. That study was in preparation for his admission to the Paris Conservatoire, which he entered in the following year, where he studied organ with Eugène Gigout, who was by then in his seventy-sixth year. There is no doubt that his exposure to the genius of both Tournemire and Vierne in their respective organ lofts had a formative influence; Duruflé was to retain his admiration for these two masters for the rest of his life. Duruflé gained the premier prix in organ in 1922 and went on to win premiers prix in harmony in 1924 (Jean Gallon’s class), fugue in the same year (Caussade’s class), accompaniment in 1926 (Estyle’s class) and composition in 1928. Duruflé’s composition teacher was Paul Dukas who, like Tournemire and Vierne, was to exert a lifelong influence over Duruflé’s creative output. In 1930 Maurice Duruflé was appointed organist of St Étienne-du-Mont, a post he shared with his wife Marie-Madeleine Duruflé-Chevalier from 1953 and one which he was to hold until 1975, when he suffered a bad car accident which was to prevent him from composing for the rest of his life. In the same year, 1930, Duruflé won the first prize offered by ‘Les Amis de l’Orgue’ for his Prélude, Adagio et Choral varié sur le thème du «Veni Creator», Op 4, having won the first prizes offered by the same society for organ performance and improvisation; the score is inscribed ‘in affectionate homage to my master Louis Vierne’. In this work some of the characteristics of Duruflé’s music are manifest. The work is strongly influenced not only by the Gregorian plainsong theme which is heard at the outset of the work, but also by the shapes of the plainsong phrases; the composer had a fascination with plainsong which is best described by Duruflé himself, but here in connection with what is perhaps his best-known work, the Requiem of 1947: ‘As a general rule, I have above all tried to feel deeply the particular style of the Gregorian themes: and I have done my best to reconcile as far as possible the Gregorian rhythmic patterns, as fixed by the Benedictines of Solesmes, with the demands of the modern bar-structure.’ Duruflé shared with Fauré (sometimes called ‘le grégorianisant voluptueux’—the voluptuous gregorianist) a love of the shapes and colour of plainsong. In 1936 Duruflé won the Blumenthal Foundation Prize for his Trois Danses for orchestra, Op 6. It seems curious that Duruflé should write his Trois Danses and be honoured with such a prize, and yet Jehan Alain, killed in action at the battle of Saumur by a shell, and who had written his own set of Trois Danses for organ between 1937 and 1938, should be honoured by Duruflé’s next work, his Op 7 Prélude et Fugue sur le nom d’Alain. Further still, as if by a premonition, it is ironic that Alain should have inscribed the second of his Trois Danses, a funeral march entitled ‘Deuils’ (‘Mourning’), using the words ‘In honour of a heroic memory’, and that Duruflé should then inscribe his own Prélude et Fugue sur le nom d’Alain ‘To the memory of Jehan Alain, who died for France’. Duruflé was honoured further by the Department of the Seine who awarded him their Grand Prix Musical in 1956. In 1961 he received the Vatican citation of Commander in the Order of St Gregory for the contribution he had made to sacred music. In addition to publishing articles on church music, and his post as Titulaire at St Étienne-du-Mont, Duruflé had deputized for Louis Vierne between 1929 and 1931 at the Cathedral of Notre-Dame. He also deputized for Marcel Dupré’s class at the Paris Conservatoire in 1942 where, in the following year, he was appointed professor of harmony, a post he held until 1969. M and Mme Duruflé were almost killed in May 1975 in a car accident near Valence, whilst driving home. A car hit them head-on and both suffered extensive injuries. Mme Duruflé regained her phenomenal powers as a keyboard executant, although M Duruflé was only partially to recover and the accident sadly ended his professional career. On 16 June 1986, Maurice Duruflé died at the age of eighty-four, having been in hospital for several months. As a tribute to his life and work, the composer’s Requiem, Op 9, was performed at a memorial service on October 11th in the same year. As a performer, Duruflé toured extensively, visiting North Africa, Russia and North America, writing about his experiences in an article entitled ‘USA–USSR’, which was published in the French journal L’orgue. He also championed the music of his teachers, publishing Trois Improvisations by Louis Vierne in 1954 and Cinq Improvisations by Tournemire in 1958, having reconstructed the works from gramophone recordings made in the 1930s. Amongst his own recordings is a performance of Poulenc’s Organ Concerto, a work of which he had given the premiere of in 1938, having advised the composer on the details of the organ part. Duruflé made a number of other recordings, including several in America, as well as recordings of his own music with his wife in Soissons Cathedral and at St Étienne-du-Mont in Paris. Composition was a difficult task for Duruflé and his music was constantly revised. Even after a substantial length of time had elapsed subsequent to the composition of a work, Duruflé seems to have been unable to resist a critical reappraisal of his work. There can be few composers who have devoted so much of their life to such a small number of compositions. By the same virtue there can be few composers who have produced such high-quality workmanship in their creative output, and whose complete work contains so much interest and variety. The Prélude sur l’Introit de l’Épiphanie, Op 13, dates from the early 1960s. It is one of this composer’s less well-known works, and appears in a volume of compositions (Orgue et Liturgie) assembled and prefaced by the French musicologist Norbert Dufourcq. Each of the Préludes in the volume is based on a plainsong introit. Duruflé’s Prélude is on the introit for the Mass of the Epiphany ‘Ecce advenit dominator Dominus’. The composer has carefully set the Gregorian rhythmic patterns resulting in a series of bars of irregular length and flowing musical content. The Suite pour orgue, Op 5, was completed in 1933 and published in 1934. Dedicated to Paul Dukas, the Prélude owes something to Dukas’s own Sonata for piano, written between 1899 and 1900. Duruflé’s Prélude is written in E flat minor and shares that same brooding key with the first movement of Dukas’s own Sonata. Duruflé felt uneasy about having his works published lest they prove to be imperfect in some way. The composer grew to dislike the Toccata and he refused to perform it for the recordings he made with his wife, having expressed his dissatisfaction with it. He revised the score and added a new ending at a later date. The Suite is a remarkable achievement: the opening Prélude maintains its brooding character by sustaining the dominant of E flat minor, giving rise to the sensation that something almost ominous awaits the listener. The Sicilienne is strongly Ravellian in character, whilst the demanding Toccata has been described as ‘one of the best examples—if not the best and most satisfying—of the many French movements of its kind’. The Prélude, which is sombre in character, is composed in the form of a diptych. A single theme, presented in three successive expositions, gradually accumulates the power of the organ. The second part consists of a long recitative, developing the first notes of the theme. The Sicilienne is of classic construction, comprising three statements of the main theme and two episodes. The contrasting of timbres and a quest for colour have been the composer’s aim, as well as putting into relief the evocative character becoming to this style of piece. The Toccata, which is in ternary form, begins with a short introduction, preparatory to the entry of the rhythmic and vigorous principal theme, which is given to the pedals. In the middle section, a second theme appears, and is later combined with the first. Finally, a return to the opening measures, and a brilliant conclusion with the second theme. Charles Tournemire is the dedicatee of Duruflé’s Scherzo, Op 2: ‘To my dear master Charles Tournemire in grateful homage.’ This work was written in 1926 and was subjected to some revision. It is in a similar compositional idiom to Tournemire’s own work. The opening material, characterized by its cross-rhythms, appears only briefly before the bright scherzo theme takes over. The initial material, which later undergoes development in a variety of keys and eventually concludes the music, is carefully contrasted with the vivace scherzo theme in a variety of ways. The Prélude, Adagio et Choral varié sur le thème du «Veni Creator», Op 4, the first of the three major organ works, opens with the flute stops spinning a fine web of sound based on the opening phrase of the plainsong melody. A reed stop in the pedals announces a contorted version of the second phrase of the plainsong theme. The triplet figure returns on the flute stops before the third phrase of the plainsong is adapted. The reed stop returns before the fluttering opening triplet figure brings the Prélude to a close. A short section marked ‘Lento, quasi recitative’ leads into the Adagio proper which starts in G minor and moves unpredictably to G major before plunging into the key of B flat minor where a darker mood gradually assumes more prominence. This passage may well be Duruflé’s finest for the organ: the music becomes increasingly chromatic and the transition from the opening Adagio to the climax is achieved in the most seamless manner. Finally the Choral which has only been seen through a glass darkly, as it were, is presented in full, first by the organ, and then, on this recording, the plainsong is sung by the Gentlemen of St Paul’s Cathedral Choir, and the four variations are performed as versets. The first variation is written in four parts. The theme appears in the pedals whilst the right hand plays an elaboration of the theme. The second variation is for manuals only, whilst the third variation is a canon at the interval of the fourth. The final variation is a brilliant toccata, introducing the theme in canon between right hand and pedals. The music winds up to a glorious climax; Duruflé saves his master-stroke for the coda marked ‘tempo poco più vivo’ when he presents the plainsong ‘Amen’ (only hinted at in the organ music until that point) in the pedals on full organ. The Fugue sur le thème du Carillon des Heures de la Cathédrale de Soissons, Op 12, is dedicated to Canon Henri Doyen, organist of the Cathedral at Soissons, and the descending eight-note theme is taken from the carillon there. Duruflé, the contrapuntal craftsman, uses the theme in inversion, augmentation and stretto, by which time the joyful carillon has infused the entire toccata-like texture and the fugue comes to an end in A minor with a series of crashing chords.